Bald cypress or baldcypress? It's a question that vexes scientists, plant taxonomists and lexicographers to no end. The root of the problem, so to speak, is that the bald cypress (or baldcypress) and its close relative the pond cypress are not, in truth, real cypresses at all. While both are members of the taxonomic family Cupressaceae, along with the "true" cypresses, these South Carolina natives are actually in a different genus than other members of the cypress family. Bald and pond cypress are both in the genus Taxodium, rather than the genus Cupressus, which leads some experts to the conclusion that they should always be differentiated from "true" cypresses by having their modifiers hitched more firmly to their roots; the result of which would be "baldcypress" and "pondcypress." The science may be firmly settled, but the semantics are not. " 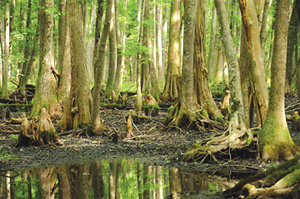 'Baldcypress' is supposed to be one word, even though the popular press often splits it into bald and cypress," says Dr. Vic Shelburne, professor of Forestry and Natural Resources at Clemson University. But Webster's New World College Dictionary treats bald cypress as two words (as does Microsoft Word's "spellcheck" function). 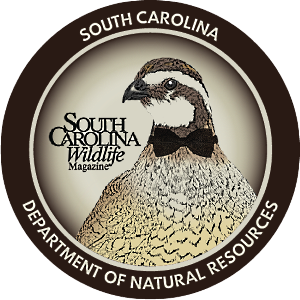 South Carolina Wildlife has for many years relied on the classic reference work, Manual of the Vascular Flora of the Carolinas, to referee the spelling of the species names of native South Carolina plants. Last year, however, we made the decision to switch to the U.S. Department of Agriculture's Natural Resources Conservation Service online plant database to resolve such questions (plants.usda.gov). At any rate, on this one, Vascular Flora, the federal government and Webster's are all in agreement, so for SCW, "bald cypress" it is.